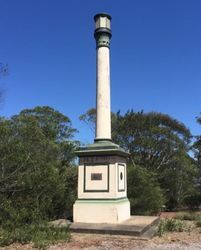 The Pass of Victoria Monument is dedicated to the sesquicentenary of the opening of Victoria Pass which was constructed under the direction of Surveyor-General Major Mitchell. The achievement of Surveyor General Major Mitchell in constructing a descent of Mount Victoria is indicative of the importance placed in his role in the development of the colony and its expansion to the western districts. In 1827 the explorer Hamilton Hume made a Journey over Bell’s Line of Road and located a new line from Hartley Vale to Bathurst. 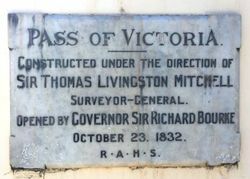 The new Deputy Surveyor, Major Thomas Mitchell was subsequently sent to examine Hume’s discovery and reported it to be “the most eligible that can be found” in terms of avoiding Mount York and Blaxland. However, he also pointed out that it was not accessible to the settlers at Fish River and O’Connell Plains, and that it avoided the grassy flats of Hartley Vale. He proposed a more direct route to Bathurst, descending from Mount York by an “inferior ridge or colline which falls gradually, advancing into the valley near Collit’s Inn.’ In January 1829 the Surveyor of the Roads and Bridges, Edmund Lockyer reported that this line, as proposed and recommended by Major Mitchell when completed would “make the descent comparatively nothing”. Work began on this new descent in 1829 under Lockyer’s direction, the third in only fourteen years . This descent became known as Lockyer’s Road. This road involved large scale works including extensive cuttings embankments and type 2b/3a retaining walls up to 2 metres high (refer Section 9). Sometime in 1829, it occurred to Mitchell that a pass might be made over “a great abyss” at Mount Victoria. This would cut off the roundabout location of Lockyer’s Road and the descent of Mount York. In 1830, Mitchell suddenly removed the gangs from Lockyer’s line to this new site. Mitchell reported that the new route down Mount Victoria simply required the “lowering of a narrow crest of rocks”. He declined to mention the massive works required to fill and span the chasm in its path. A map was subsequently produced showing Lockyer’s line from Mount York to Bathurst as a “road cleared by mistake”. A great struggle between Mitchell and Governor Darling ensued over this action, as the line had been relocated without approval. Mitchell’s choice eventually prevailed, and by 24 September 1830 convict gangs were carrying out construction at Mount Victoria. 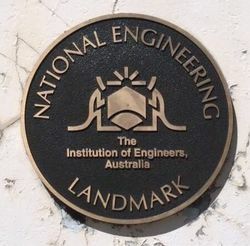 This plaque was unveiled on the 23rd October, 1982 by Surveyor-General Jack Darby F.I.S. Surveyor-General Major Thomas Mitchell identified this line of road and ordered its construction to bypass the steeper descent at Mount York. The road with its massive stone-walled causeway was constructed between 1830 and 1838 by about 300 convicts. Engineering design and seupervision were successively under the control of Phillip Elliot, John Lambie and John Nicholson. 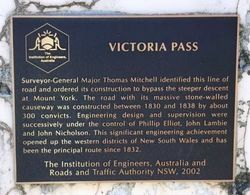 This significant engineering achievement opened up the western districts of New South Wales and has been the principal route since 1832. Constructed under the direction of Sir Thomas Livingston Mitchell Surveyor -General.